Hard to swallow for a pitcher that was heralded as an anchor for the Nats’ struggling rotation. Well, he’s an anchor alright, just the sort that drowns you instead of one that keeps you in place. It only gets worse if you think about his $15M contract. That’s $1M for every point of ERA he’s racked up this season. At this point, I wouldn’t be surprised to see Marquis stay out at least another 1-2 starts until either Maya or Zimmermann are ready to come up. Marquis has a lot to prove if he wants to stay in the show, though, and another outing like these last two might see Stammen return from the pen. It was open season tonight for the D-backs, who would collect seven hits off Marquis, and then another five off Miguel Batista in the sixth. 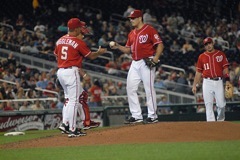 The only solid moments on the mound tonight came from Craig Stammen’s single inning, and Doug Slaten’s two. They combined for three innings of good ball and allowed just one inherited runner to score. You’ve got to like that much, at least. Flipping the page to look at the Nats’ side of the scorebook, you’re left wondering what the heck happened. The last time this team faced the Dbacks’ Ian Kennedy, he went just 4 innings, giving up 8 hits and 4 earned runs, including two home runs to Adam Dunn. Tonight, though, he was largely lights out, going 7 full innings and racking up 7 K’s, giving up just two runs. His only mistake of the night was a first pitch fastball to Ryan Zimmerman who sent the ball into the Arizona bullpen for his 23rd home run of the season. The Nationals had several opportunities with men in scoring position, but nothing could get those men home. Plenty of strikeouts, shaky groundouts and bad swings at the plate tonight, and that’s not going to win you games. Before the ballgame tonight, the Nationals put the full court press on 12th round draft pick Robbie Ray. They had a jersey waiting for him after his bullpen session at 1pm, and they had Ray talking with pretty much everyone before the game. He had a lengthy conversation with principal owner Mark Lerner during batting practice. Ray has promised to go to the University of Arkansas in the fall, but the Nationals drafted his rights this spring. During BP, General Manager Mike Rizzo said that while he respected Ray’s decision to go to college, they wanted to have him in to “show off their campus” to the young pitcher. NatsFarm.com has a great mini-scouting report on Ray, and if the Nats can convince him to delay college and make a run at the pros, he could be a good pickup. Rizzo also spoke briefly about the negotiations to sign outfield Bryce Harper to a contract, but was very coy with details. He mentioned that they’re in constant contact with the Harper camp, lead by Scott Boras, but that they recognize that this, like the drafting of Stephen Strasburg, is a pretty special circumstance. I wouldn’t be surprised to see this come down to Monday night’s deadline for signing draftees, say, 11:59:45 or so.